As it is now, Florida is one of only two states in the nation that does not require car seats for children who have outgrown baby seats but are still too small for seat belts. But come Thursday, a new law will go into effect that will greatly improve Florida’s child safety seat laws. The new law essentially mandates booster seats for children aged 3 to 6-years-old. The new law will require children to be in booster seats until their 6th birthday, however, experts say to keep kids in the booster seat until the seat belt fits properly. According to law enforcement, children restrained the wrong way in vehicles is a daily problem. Not only is this a danger for children, but now it translates into a $60 ticket and three points on their driver’s licenses. According to experts, the best guideline for child car seats is to go by your child’s height and weight. They need to be at least 4’9 and weigh between 80 to 100 pounds before they can use an adult seat belt. Experts say that when used properly, car seats elevate kids so the seat belt can secure them properly by going across the chest in the proper way. There is one exception to this new law, children ages 4 or 5 may ride with just a seat belt if the driver is not a member of their immediate family and if they are being given a ride due to a medical emergency. The following car seat guidelines are from the FLHSMV and should be used when driving with a child in your vehicle. 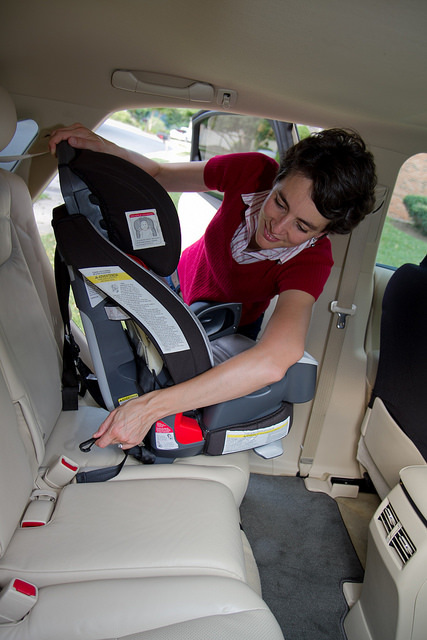 Birth – 1 year old and at least 20 lbs: Use a rear-facing child car seat in the back seat of the car. 1 year old and 20 lbs. – 4 years old and 40 lbs. : Use a rear-facing child car seat in the back seat until they outgrow the weight and height limit of the child car seat. Once a child is over 1 year old and weighs more than 20 pounds, you can switch to a forward-facing car seat in the back of the car. 4 years old and 40 lbs. – 8 years old or 4’9″ tall: Use a forward-facing child seat in the back seat until a child reaches the weight and height limits recommended by the manufacturer, then switch to a booster seat in the back of the car. 8 years old or 4’9″ tall –12 years old: Use a booster seat in the back seat until a child is big enough to use the car’s seat belt. Once a child turns 13, they can sit in the front seat of a car. If your child has been injured in an accident, call a Tampa Bay Injury Lawyer at Whittel & Melton at 813-221-3200 or toll-free at 866-608-5529. You can also reach us online to schedule a free consultation.